Duplicate CDs and DVDs without hassling with a computer and software - no buttons to push. 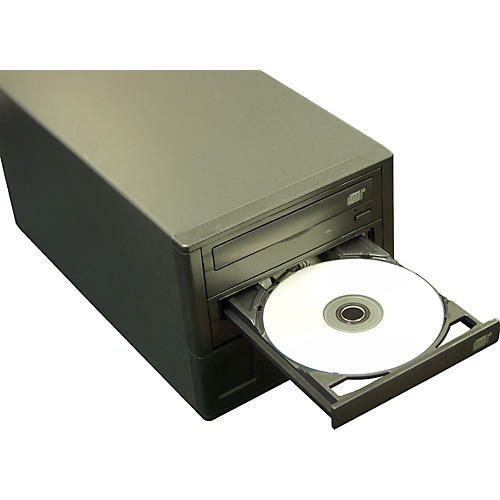 An incredible value, the ZipSpin C121LG Load & Go 52X CD duplicator burns both CDs and DVDs quickly and accurately - you may never want to use your PC to copy CD/DVDs again. State of the art "load & go" technology starts the duplication process automatically when discs are inserted, and automatically ejects the CD/DVD after successfully copying. Housed in a rugged, compact design, the C121LG is perfect for creating duplicate back-up discs, sharing and distributing music with friends, even copying CD+G discs. This unit copies CDs at a lightning fast 52X, so it only takes about 4 minutes to copy a full 80-minute CD. It reads and writes all major CD formats and successfully operates with a wide variety of blank media. Its high-grade industrial cooling fan extends the life of the optical drives, ensuring successful duplication for years to come.